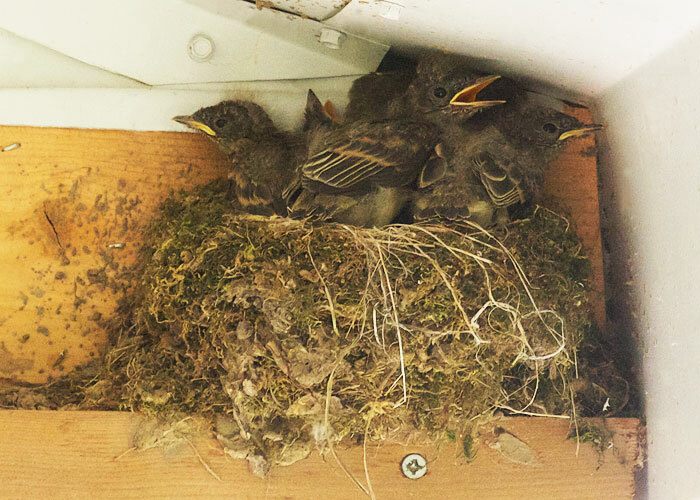 There are five baby eastern phoebes in the nest, getting more crowded by the hour. It's hot today, and humid. Often the nestings have their beaks open to cool themselves. This morning I was sure they would fledge today, or that at least one would get pushed out. At 3:40 this afternoon, they're still jostling in their small bed. I can see this nest from the kitchen window, as the phoebes chose to nest under the eaves there.